How do you make your birthday invitation cards? In our modern world, most of us prefer to use personalize birthday cards and easy to produce cards. This is what I use in making my daughter’s Birthday Invitation Card using HP Photo creations. Since I am using HP printer, the HP Photo creations software comes with the installation of the HP printer driver. Look at how simple, cute, and neat the Birthday Invitation Card using HP Photo creations that I made. For the past few days, this is one reason why I am so busy. I am hands-on in preparing my little girl’s mini-party. The HP Photo creations software is so easy to use that you can edit photo, graphics, text, touch-up, and design. Apart from birthday invitation cards, there are many themes that you can choose such as for Holidays, Milestones, Sentiments, announcements, and many others. There is also ready-made template for calendars, collages, photo books, and for business. I am loving my HP photo creations because I can make different designs perfect this holiday season. This is an excellent software for HP printer users to have at home that you do not have to go out to print your birthday invitation cards or any other printing designs that you need. I recall using several programs before just to create a beautiful card design. So far, HP Photo creations is my favorite today. Talking about my daughter’s mini play party, I will be preparing an intimate play party for the girls only. Her playmates will be the little girls from our neighborhood in the subdivision. I will bake yummy cupcakes, cookies, and something good for the girls. For the giveaways, I will be preparing a simple sweet and girly items. I am going to share what happens to our mini play party maybe next week. I hope that it will turn out to be fun. 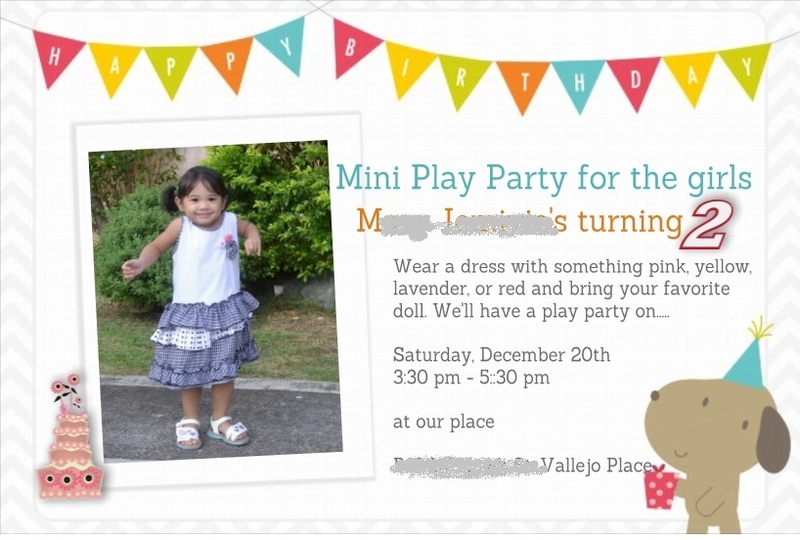 I am sure the little girls like what I created for my daughter’s Birthday Invitation Card using HP Photo creations. Stay happy!